We have three types of content on Developer Community(DC): articles, questions, announcements. And answers to questions. And videos. The articles are about the best practices and experience with InterSystems technology and products. 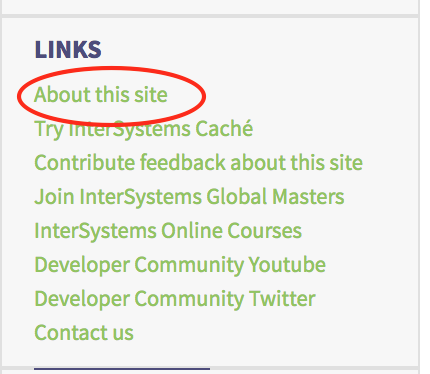 Both InterSystems employees and community members post articles. You can find release notes and new features descriptions and the articles regarding experiences and InterSystems technology examples. And of course, its a place where you can ask your question and get the answer from the most experienced engineers in InterSystems technology from all over the world. Register on DC to post and comment articles, ask questions and give answers. Here are the guidelines on how to post. Note! Moderators may remove posts that are not related to InterSystems products and technologies. Registered members can vote. Vote if you like an article, a question or an answer. If you downvote, please consider adding a comment if you think the post can be improved. Posts are categorized by Tags. There are mandatory tags, which called Groups in editiing. Mandatory tags are related either to InterSystems Products, or InterSystems Services. You need to supply at least one of these tags. Tags are tags, the things which help to categorize posts. You can subscribe for tags to get notifications via email or RSS. Also, you can follow the member you like - it's a subscription to member's posts and comments. On the main page, you can see the feed of posts where the topmost is the either latest posted or the latest commented or answered. You can use feed filters to see only the tags you subscribed, the most voted and new postings as well. Also, we have DC analytics site to check some figures about DC members, posts, answers, etc. For all the rest see the Developer Community FAQ. Registered members can receive email notifications regarding different actions on Developer Community. Please see this article how to deal with that. Also, everyone can subscribe to RSS: for everything and for specific tags. It's our InterSystems Advocacy Hub. If think you are an advocate of InterSystems Technology please join the team of hundreds of InterSystems advocates all over the world. We'll provide you challenges, badges, and rewards of course. See the details. Find tools, frameworks, solutions, technology examples on Developer Community Github. See the details. If you have any questions about the site, ask in this group or see the FAQ. We have Twitter to tweet about all what is valuable in Developer Community and Facebook page if you like it more. And we have DC Telegram channel for the same purpose if you like Telegram. And we started the Developer Community YouTube Video Channel. And also we have Developer Community Subreddit for all the most interesting announcements. Welcome to InterSystems Developer Community! I am still confused between GROUPS and TAGS, they seem like the same thing. Also, it would have been nice to have this information and much, much more at the beginning. I did ask for documentation when DC was just starting but was told it should be intuitive, but it was never that to me. (at least that was in my memory). Anyway, the documentation is nice, but should be expanded and available through a shortcut, or is that a tag or group? You say if I have any more questions, ask in this Group, how do I know what Group I am in? And how do I ask in a Group? Groups and tags are both tags. But the group is the way for us to be sure, that every post relates to something very significant to what our Company does. It's either InterSystems product, technology or service. and in Community menu - "About the site"
Sorry, Mike! I just forgot to put the link to the group. But of course, you can ask here in this post too. And yes, this post would be updated once new features and new better ideas to describe the Community will appear. I couldn't help notice that this post has a -1 rating. I can't see anything wrong with the post so curious what the reason for a down vote would be. This initiated a change that prompts down voters with the message, "Please consider adding a comment if you think the post can be improved". We all make mistakes so its good to get this type of feedback. It also helps anyone landing on the answer months or years down the line and not realising the answer they are trying to implement has a mistake. Perhaps the DC site could do with something similar? Thanks for the feedback, this is very useful and fair input. So I've introduced the statement about downvotes to the description. We'll add a hint about commenting triggering by downvote. Thanks! I was the one who put the downvote in, and I explained myself in the reply. "You have a limited number of votes per day, and answer down-votes cost you a tiny bit of reputation on top of that; use them wisely." I don't understand how using down-votes cost someone "a tiny bit of reputation"
Seems to me when a down-vote is used, it should enhance ones reputation as you are increasing the quality of a post. "Use your downvotes whenever you encounter an egregiously sloppy, no-effort-expended post, or an answer that is clearly and perhaps dangerously incorrect." If that is the criteria for downvotes, they will never be used, so why even have them? In relation to stackoverflow I think the intention was to stop people abusing the implementation of the down vote. I'm not sure that's relevant here, unless the main DC site started displaying some kind of reputation score in the same way as stackoverflow. > Then downvotes will never be used, they why even have them? It should just say "contains incorrect information". Despite that, there are 1,000,000+ users on stackoverflow regularly using the down vote so it must be working. We have a nice welcome video now. Check it out! Recently we got yet another "spam" post. It was hidden. You can apply your enhancement requests to DC in this repository. And you can monitor the progress in this kanban projects. E.g. here is the June 2018 project.